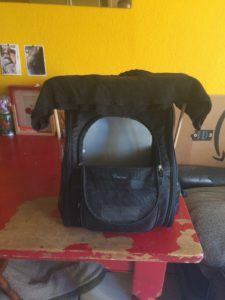 The cat shelf I built attaches to the cat backpack I bought. And allows my cat to rest at my shoulders while going on walks. Tools used include: Staple tacker, 1/2” drill and bits, Hand saw, and Miter box. It took about 4 hours total. Send us a photo of yourself with the tool you borrowed and your project, along with a sentence describing your project to be featured on our site! ©2019 Friends of the Oakland Tool Lending Library. All Rights Reserved.